This product contains micronized BCAAs, precisely dosed L Glutamine as well as L Citrulline, with an interesting orange tang. Citrulline Malate is not just to be considered as a strong nitric oxide enhancer, but it retards fatigue and enhances energy levels. This particular form is exceptionally beneficial as it merges malic acid (malate) with citrulline. Per serving provides 7 grams of BCAAs in 2:1:1 proportion of leucine, isoleucine and valine. It has a delicious orange flavor. Devoid of stimulants, it is convenient for use anytime. It dissolves easily when mixed using a shaker or stirred with a spoon. Along with that, it also helps in total recuperation as well. BCAAs refer to Branched-Chain Amino Acids. “Branched-chain” essentially means the chemical framework of the BCAAs themselves. These can be obtained from protein-rich foods like eggs, meat as well as dairy. BCAAs are even a well-liked nutritional supplement that can be purchased in its powder form. Out of the nine vital amino acids, a total of three are categorized as branched-chain amino acids (BCAAs). They are leucine, isoleucine, and valine. BCAAs have been extensively used to boost muscle, reduce muscle fatigue as well as to combat the symptoms of muscle soreness. 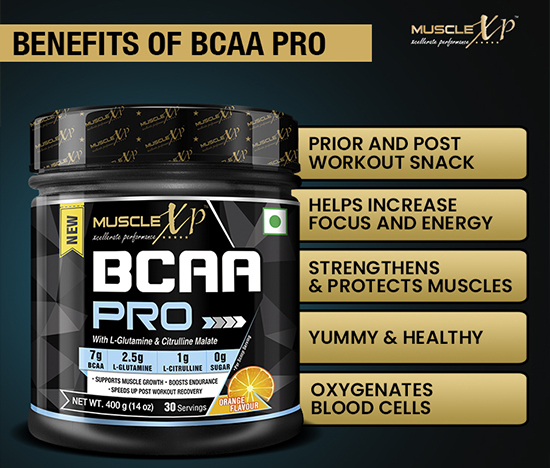 MuscleXP BCAA PRO is usually considered best for consumption at the time of workouts but is also known to be as effective prior and post a training routine. It is regarded as a vital supplement that helps boost focus and energy. It provides extremely important amino acids that help in muscle development and recuperation. MuscleXP BCAA PRO is known to strengthen and protect muscles with a total of 7 grams of BCAAs per serving, together with L-Glutamine as well as Citrulline Malate. It particularly helps build muscles in individuals who engage in intense workouts. BCCA offers a considerable boost to a person’s muscle strength and this product caters to individuals who participate in extensive muscle workout sessions. This is a yummy, satisfying, sugar-free product for dealing with a rigorous gym session. BCAAs help to increase oxygen supply to the muscles, which helps boost energy level at the time of exercise. This product is highly recommended for serious bodybuilding. It provides the important amino acids for building muscles. The powder dissolves easily and the orange flavor makes it delectable. Getting the important amino acids for building muscles from this product. The orange flavor made this an enjoyable drink. Useful supplement for boosting energy, endurance and muscle mass. Mixes quickly with water and tastes good. This is an excellent source of the additional amino acids without which increasing muscles is not easy. It gives me energy and speeds up post workout recovery. 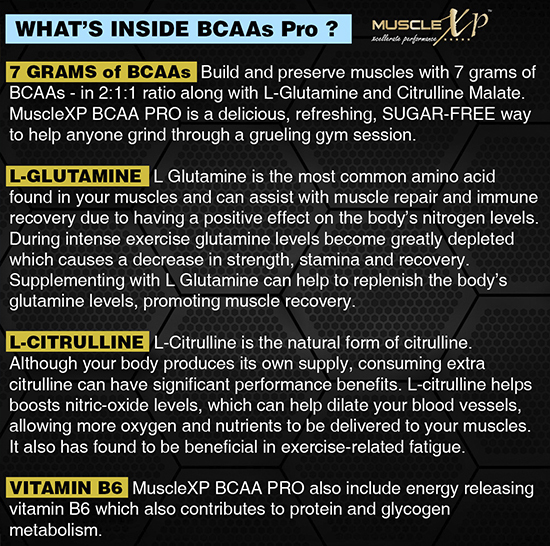 Here is a BCAA supplement with the amino acid glutamine that is helping me in building muscles. Don’t miss this product if you are serious about body building. It is great for muscle recovery and growth. Adults can take in 1 scoop of MuscleXP BCAA PRO powder in between their meals, or approximately 30 – 45 minutes prior to workouts. The same amount can be consumed immediately after a workout session. Blend one levelled scoop (13.3g) with about 250-300ml of cold water. At the time of your training, it is necessary to keep drinking ample quantities of water to remain hydrated.